The of thorax beige feathers in pink tint, the white rump, black tail, blue - the black wings. Loud voice, croaking. Occurrence It steps out in every genus forests enough in great number, especially from oaks. More more and more often it is possible her to meet in parks and gardens. It feeds on with summer insects, snails and different changes animals, in tym, young aves and ova's chosen from nests rodents, lizards.It likes cherries. It eats with autumn acorns, which accumulates in larger quantities in different places in the ground, in hollows, trees' cracks, under bark or in moss. It tastes her beechnut and hazelnuts also. One hatch under end of April and in May leads out .It in case of loss first the peer's hatch repeats him. It builds it near trunk, the most often on height ok. 5 m. Loose construction from sticks,lining from horse hair, plants' soft parts, feathers and moss. Under end of April or in May, in one-day spaces, the female folds 5-7 ova's. Almost spherical, white, ova's times greyish or greenish, about average dimensions 40x33 mm. Sitting has lasted for composition first or second ovum by 16-17 days. In repeated hatches (under end of May or in June) usually already tylko 3 be folded-4 ovum. They look after both parents hatch and provide for Near nest solid vocal contact rather they do not speak. Nestlings leave after ok. 21 nest-22 days. Yet by ok. 3 weeks be given additional food by parents. Hold on later still near the parents, which warn it the voice or even actively the weapon before birds of prey. for this great picture and thank you for the note too! 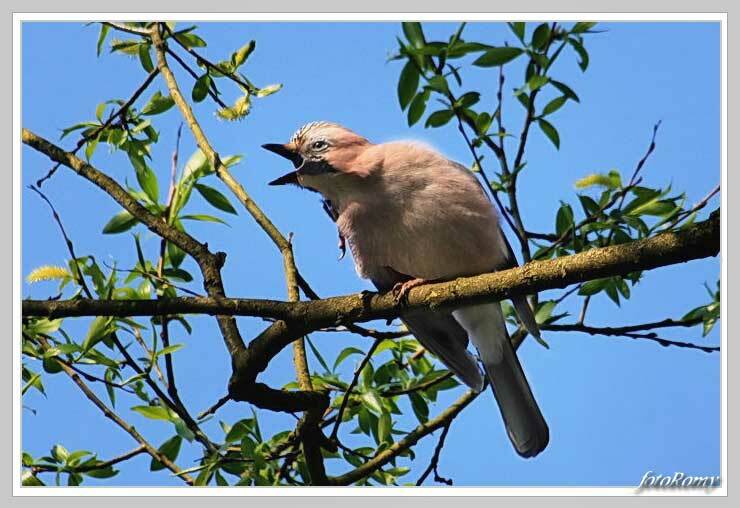 An excitingly capture of this singing jay from nice POV with fine details and wonderful composition. Piekny ptak ale nie od spodu. Dosc ciekawa typowa poza dla niej. What a timing and nice moment you have captured. I like natural scene, expressive pose of a very cute bird and nice tree branches pattern. Colours of the leaves, sky and bird are very nice and pleasant. Well done and TFS.